NVAX (no code name) was the fourth and penultimate VAX microprocessor. Bill Herrick was the project manager; Mike Uhler was the supervising architect and lead microcoder. NVAX incorporated numerous advances over its predecessors: single chip design (no external floating point or cache controller); macro-instruction pipelining; patchable control store. NVAX reused the fully-pipelined floating point processor from Rigel. Despite its complexities, NVAX actually finished ahead of schedule and shipped in systems before the end of 1991. NVAX was implemented in DEC's 0.75u triple-metal CMOS4 process. A variant, called NVAX+, was pin-compatible with the first Alpha processor, EV-4. This allowed the first generation of Alpha mid-range SMP systems (VAX 7000) to use a single board design for both VAX and Alpha variants of the system. NVAX operated over a frequency range of 71Mhz to 90Mhz: the fastest CISC processor in the world. NVAX+ was shrunk into DEC's 0.5u CMOS5 process. This version operated at frequencies up to 143Mhz and was also the fastest CISC processor of its day. NVAX shipped in late 1991 and supported the VAX product line until the termination of new system sales at the end of the century. NVAX was used in low end VAX systems (VAX 4500 and 4600) and mid-range systems (VAX 7000 and VAX 10000). NVAX+5 shipped in 1994. 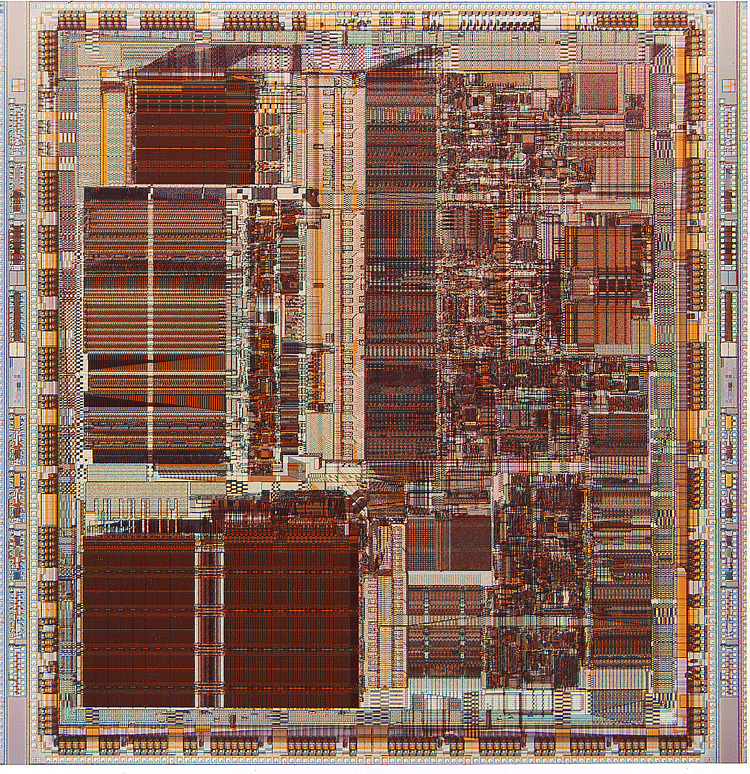 Just as Rigel is the realization of Nautilus (VAX 8800) in silicon, so to a large extent was NVAX the realization of Aquarius (VAX 9000) in a single chip. Work on NVAX began in the fall of 1987, with a part-time team; I wrote the initial sketch of the Ebox (execution unit) microcode. Serious work began in early 1988, when Bill Herrick, Mike Uhler, and Bill Wheeler freed up from Rigel. The performance model had been completed, and microarchitectural work started, by the time I left the Microprocessor Group in the fall of 1988. NVAX went very smoothly as an implementation project, taping out ahead of schedule. Debug also went well, with fewer bugs found after tape-out than in any previous VLSI VAX design. The patchable control store made an important contribution in shortening debug, by allowing microcode workarounds to be used throughout debug. Throughout its life, NVAX was the focus of controversy within the corporation. Its features, functions, and performance overlapped the ECL-based VAX 9000, a mainframe-class system priced at over $1M. As soon as NVAX became an official project, its backers (including me) pointed out that it would make the VAX 9000 obsolete and thus make it impossible for the 9000 to ever recoup its development costs. Proponents of the VAX 9000 could not make the mental leap to see how a single chip could replace hundreds of ECL gate arrays and supporting circuits. Nonetheless, NVAX systems shipped less than 15 months after the VAX 9000 and effectively ended the life of that product. DEC never shipped an ECL-based system after that. NVAX was presented at the 1992 International Solid State Circuits Conference.